The AFAST-1 system comprises a high-flow valve assembly with all American made components and has a full 1-1/2 inch waterway. The pistol grip handle is aluminum and is removable, it has 1-1/2″ NST threads on both ends. The shut-off bail is high strength steel and a full 1-1/2 inch opening!. The pipe is schedule 40 aluminum and the nozzle tip is machined from billet brass and drilled and machined by hand. Flow tests show between 150 and 230 gallons per minute flow, depending on engine pressure, hose length, and type. NOTE: This is NOT a piercing nozzle. Although it will punch through a normal 1/2-inch to 1-inch DRYWALL layer, it is not meant to be used as a piercing nozzle. Any other material you will have to make an access hole with hand or power tools. This nozzle assembly is designed for maximum water flow for application in a concealed space, therefore the tip is not designed to be forced through hard material. 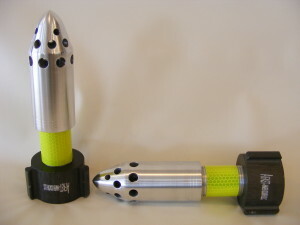 The nozzle assembly is roughly 4.5 feet long and mates to a 1-1/2″ NST fitting. The AFAST-2 is constructed of the same high quality American made materials. The AFAST-2 is designed for operating from the exterior roof area, utilizing a fire sprinkler type method to extinguish attic and confined space fires. The firefighters cut a small hole in the roof deck, or utilize an existing vent hole or burn-through area and insert the AFAST-2 down into the hole. Charge the line and let the special designed water applicator do its job. 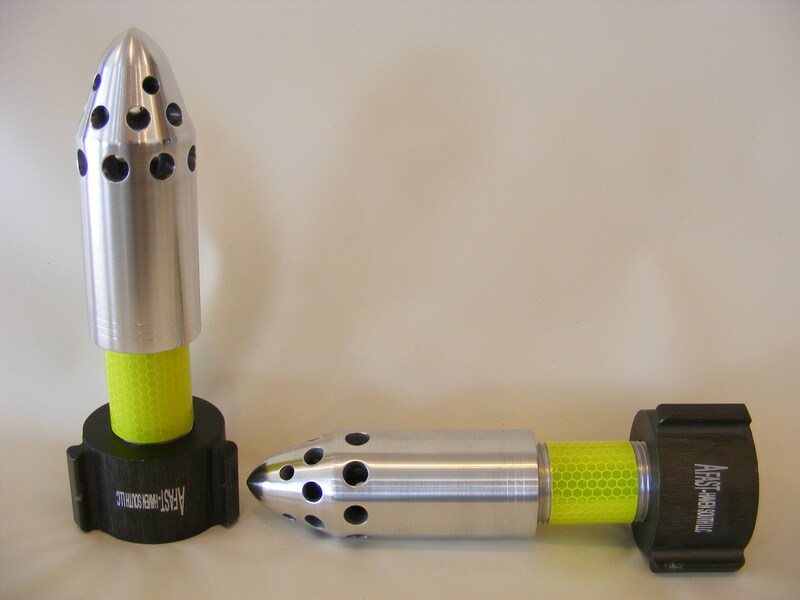 The nozzle assembly is roughly 6.5 feet long and mates to a male 1-1/2″ NST fitting. The AFAST-3 is the answer for your below grade or basement fires, as well as confined space fires. 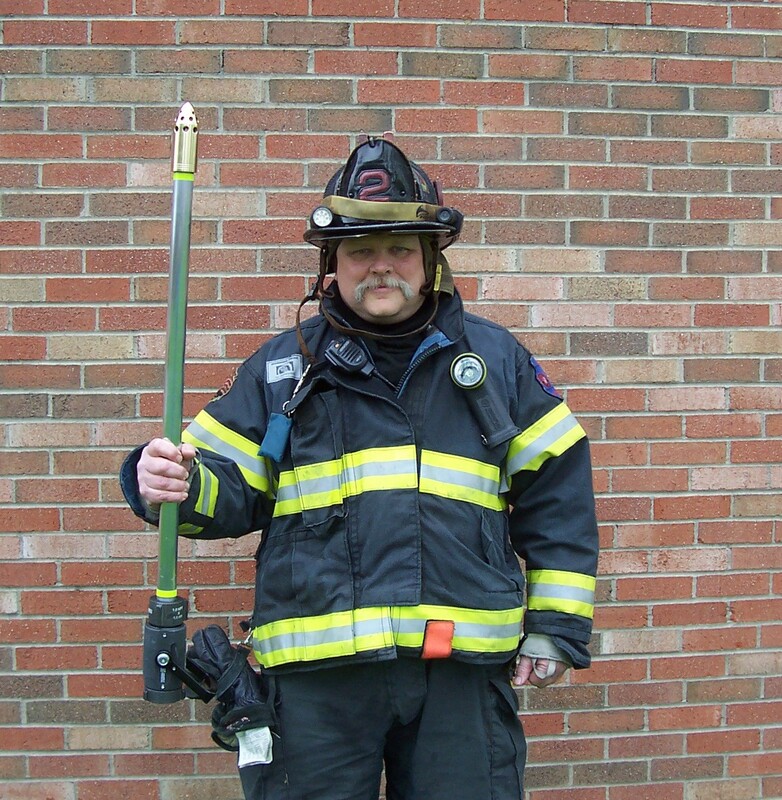 We received so many calls about the AFAST-2 and how it would work on basement fires if only the angle of the bend were less and the reach longer. Well we listened and the AFAST-3 was born! 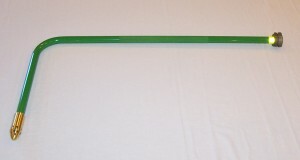 The nozzle assembly is roughly 4 feet long (not including the shut-off valve assembly) and mates with a male 1-1/2″ NST fitting. Firefighters asked us if we could make a mini-me version of the A-FAST 1 for use in wall cavities, primarily for balloon frame construction. Have no fear… A-FAST 4 is here!! We modified the tip, and instead of brass we machined it from BILLET ALUMINUM! Punch a hole in the lath and plaster, get this nozzle in there and get that fire before it gets to the attic! The A-FAST 4 has a 1-1/2″ NST fitting to attach to our A-FAST valve assemblies (for best flow results) or to your existing valve assemblies. And the beauty of it… it fits in your bunker pants pocket! The AFAST-5 Attic & Confined Space Nozzle, short version for your Standpipe Packs. The AFAST-5 system comprises a high-flow valve assembly with all American made components and has a full 1-1/2 inch waterway. The pipe is schedule 40 aluminum and the nozzle tip is machined from billet brass and drilled and machined using precision CNC machining. 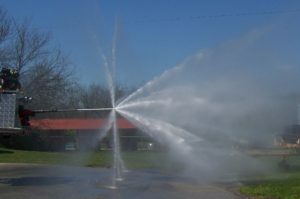 Flow tests show between 150 and 230 gallons per minute flow, depending on engine pressure, hose length, and type. 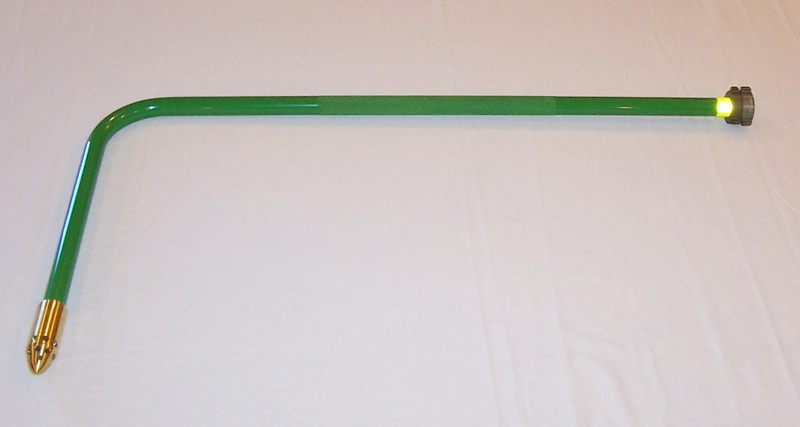 The nozzle assembly is 34 inches in length, and mates to a 1-1/2″ NST male fitting. The nozzle assembly mates to a male 1″ forestry thread or 1-1/2″ NST fitting. AFAST-6, shown with optional straight bore nozzles and pistol grip ball shut off. The AFAST-7 is constructed of the same high quality American made materials. 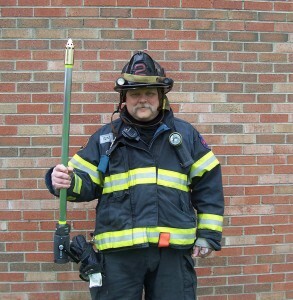 The AFAST-7 is designed for attachment to a ladder pipe 1-1/2″ NST discharge in place of a fog or straight bore tip. Designed to inject water into a window or other opening. The nozzle is milled from high quality brass with patented pending machining to enhance water or agent application. 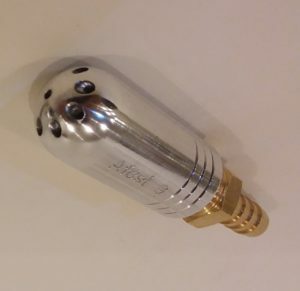 The pipe is high quality, lightweight 6061 aluminum (note: this is NOT a piercing nozzle). The nozzle assembly mates to a male 1-1/2″ NST fitting. The AFAST-8 is constructed of the same high quality American made materials. 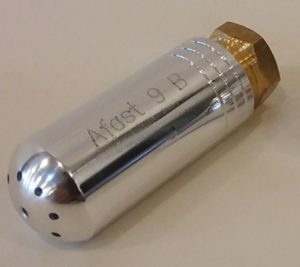 The AFAST-8 is designed for applying a water enhancing agents. The nozzle is milled from high quality brass with patented pending machining to enhance agent application. To be used with a 1.5 inch ball valve shut off assembly. These nozzles will attach to your existing 2.5 gallon pressurized water can hoses, or thread onto your wildland pump can applicator assembly. The model 9-A comes complete with brass barb assembly for inserting in the applicator hose (clamp not included). We can also supply a new hose with tip installed (contact your dealer). The model 9-B has internal female threads for installing on your hand pump applicator assembly. Complete water can AFAST 9 tip and hose assembly available.